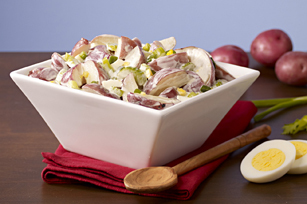 This home-style potato salad may soon be your signature dish, thanks to sweet pickle relish, hard-cooked eggs and real mayo. Mix mayo, mustard and relish until blended. Combine vegetables in large bowl. Add mayo mixture; mix lightly. Top with eggs. Prepare using MIRACLE WHIP Dressing or MIRACLE WHIP Light Dressing.